MMK College is back with the third edition of Consortium that is going to be bigger and better. 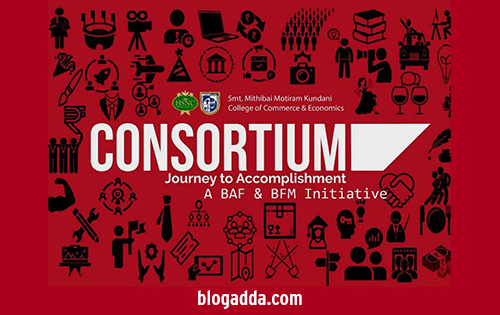 It encompasses the entire spectrum of financial markets and business communication by hosting various enriching competitions, informative events and interactive session among students from different colleges. Consortium aims to provide a look into what awaits in the corporate world by creating a virtual reality model. It aspires to provide a platform for young students to develop their skills and acknowledge their uniqueness by bestowing knowledge that goes beyond the walls of classrooms. It thrives to inculcate among students a desire to break their self-imposed limitations and strive for excellence! It is rightfully said, “One Team, One Dream.” Consortium ’19 was launched with the cast of 3 movies – “Mitron“, “Loveyatri” and “Genius“. Jackky Bhagnani, Kritika Kamra, Aayush Sharma, Warina Hussain, Ishita Chauhan, and Utkarsh Sharma graced us with their presence. An enthusiastic crowd of about 1500 people welcomed them with cheers and that marked the beginning of our journey. The Festival spanning over two days will have various events like Finance and Corporate Management, Sports and Gaming, Literary Arts, Performing Arts and Marketing. These widespread events provide various college students a platform to indulge in various activities and nurture themselves according to the growing economy. The days will bring tremendous amounts of joy and enthusiasm on the faces of students all over the place. Glad to know about it. thanks.